This zig zag quilt is officially done. I finished the binding last night while I watched the presidential debate. I would like to wash it to soften the batting and thread before I get it to its recipient. I used the heavy 12 wt. Blendables thread on top and 30 wt. Blendables in the bobbin. I like the way it looks. Yesterday I had to delete 29 spam comments by 9:30 p.m. because I still allow anonymous comments. I may have to disable them so those who use anonymous might need to try one of the other options. Tomorrow is my appointment with the eye specialist in Chicago. I hope they diagnose it so I know what direction my life is taking. I had to disable anonymous comments when I decided to stop moderating comments for that very reason. I occasionally get a spam comment but rarely more than one a month since I disabled anon comments. Just beautiful! Hope you receive good news from the eye doctor. I'm with you....no longer accept anon comments. The zig zag looks wonderful. Best thoughts for your appointment. Love the quilt! Wishing you all the best at the doctor! I will be sending my best thoughts and prayers your way. 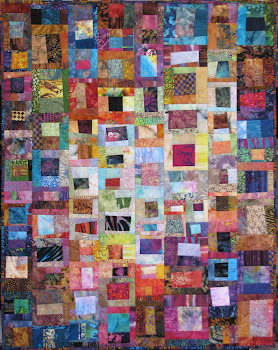 The quilt looks so cheerful and the quilting really emphasizes the design. Hoping for good news tomorrow. I do not take anonymous comments either - I also moderate my comments and they only go through automatically after the e mail they come from has been approved by me several times. What a great looking quilt! What size needle did you have to use for the 12 weight thread? I will be thinking good thoughts with your visit to the eye specialist. Wonderful! Love how you chose to quilt it and I hope you take another Official 2.0 portrait after it has been laundered so we can see the difference. Wanted to wish you good luck tomorrow with your appt. in Chicago. Hope you get good news. Best wishes for your appointment with the doc!! 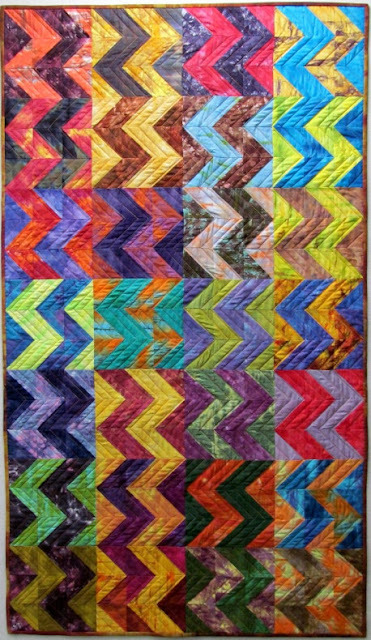 I love the shape of the zigzag quilt -- it goes with the design and colors, really bold, unusual, striking. I am surprised that spam is getting through -- blogger catches everyone of my spam comments! I hope that your appointment goes well. The quilt is terrific! Good luck with the doctor tomorrow, and prayers and best wishes for a happy outcome. Love how the quilt turned out..all those vibrant colors! I know what you mean about anonymous comments..I gave up on allowing them, too. Good luck with your appointment tomorrow. I've been there, done that with a diagnosis of my own...sending prayers your way. Will be thinking of you, Wanda--hope all goes OK at the doctor's. Beautiful quilt, Wanda. I hope you get good news tomorrow. Sending good thoughts your way and praying for a good report. Sending you healing energies and positive vibes for your appointment tomorrow. The waiting and uncertainty are draining both physically and emotionally (been there, done that). Hugs and best wishes for a positive diagnosis and prognosis. Adding my prayers to the rest, for a good report from your doctor's appointment; may they have answers, easy and successful treatments that restore you to A+ condition, and bless you with peace of mind. Wanda, all thoughts with you for Wednesday,love,hope,care and more.In my blog, the anonymous comments come to me email, and I can read and delete there.None go to the page itself. Goodness knows why anyone would send some of the most stupid words ,or even bother to spend their time like this. Fond greetings from Jean,waiting for your news, All OK here. The zip-zag quilt is gorgeous. I hope you get the diagnosis tomorrow and then are on the road to dealing with this so that you're back to normal as soon as possible! This waiting must have felt like it dragged on forever. Amen to knowing what direction my life will take now........boy do I understand THAT one. But, I'm learning to trust in God and His timing, not mine. I pray that your news will be good. We are so blessed to have access to so many new procedures and techniques for treating problems ! I REALLY like this quilt. It reminds me of the ones I made for awhile. I called them "my-side-of-the-bed quilts", because my husband was always hot and me cold, so we couldn't share enough covers for me. I just made up a couple of quilts to cover just me on my side ! Nice job, Wanda......fun to follow you all the way through this one. I was so thrilled the day that I happened to end up at your blog. 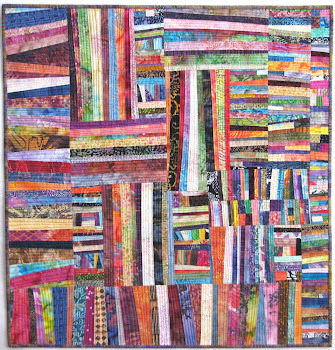 Your quilts and gardening are such an inspiration to me. I will be thinking of you as you are working through your medical issues and I look forward each day to your posts. Oh my gosh, it looks fabulous! Good luck tomorrow. I'll be thinking about you all day. I finally had to disable anonymous comments too because I started getting spam. Your quilt looks great! Good luck at the Dr. appt. tomorrow! Still sending prayers your way, Wanda. I hope you eye appointment goes well tomorrow. I had to stop the anonymous, too, and I don't get anything near the comments and visitors you do. The qult is just gorgeous. Your quilting in the zig and zags just sets it off to perfection. I like your backing and binding choices, too. Believing for a good report for you! Love it Wanda - sending positive thoughts and good vibes from downunder. Wonderful colors! This quilt is a jewel. -- Hoping for the best news from your doctor. You'll be on my mind all day tomorrow. I wish I could come down there and sit with you. Positive thinking is what we all need to do now. As I walked out of my neuro-otologists(sp?, I panicked because I didn't look at the calendar and had not taken the time to do my prayer list and I thought I had missed your specialist appointment. 15 minutes into the 2 hr drive I was just overwhelmed with the thought the visit is tomorrow. I think I was right. I'll try to be less selfish tomorrow. I love your zig zag. What a coincidence . . .I was sewing binding on a zigzag quilt last night during the debate too. Mine is for my grown son, and I call it Baby Genius Grows Up. I'll send you a link and picture after I present it to him, hopefully this weekend. LOVE your quilt! Best wishes on your eye appointment.